It's been a while since I've posted any post-renovation pictures, mainly due to not having the final touches done. It's been odd to realize that getting the big items in a room were fairly simple decisions, but adding the decorations ended up taking a long time. I knew I needed some extras for several rooms, but figuring out exactly what they were was a challenge. I was standing outside of the room to get this picture - like I said, it's tiny. 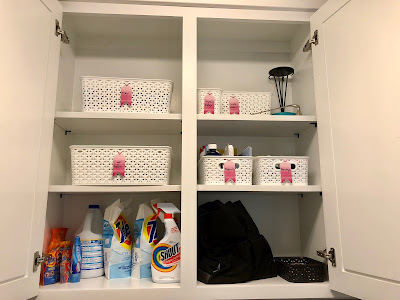 I still need something to put on the shelf above the clothes rod - I had a cute metal basket there but moved it to one of the hallway bathrooms to hold towels. I tend to do that a lot, move things around from room to room. And I'm kicking myself for not buying a cute soft pink metal step stool when I saw it at TJ Maxx a few months ago - but I hadn't decided if I could do pink in that room yet, so I held off and of course, it wasn't there when I went back. I know better - the rule of shopping at TJ Maxx is buy it when you see it because it won't be there the next time you shop. Oh well. Shelfie. Haha, I crack myself up. But look - it's so pretty! I love it. We needed a little trash can for the dryer lint, but a traditional trash can wouldn't fit anywhere near the dryer. I was wandering around an arts and crafts store one day when I saw the galvanized tin bucket and thought it would make a nice little trash bin, and it does. I found the soft pink clock at Target - it's nice to have a working clock in there again as our old clock had stopped working years ago and of course I never replaced it. There was an empty space between the trash tin and the clock for quite some time. 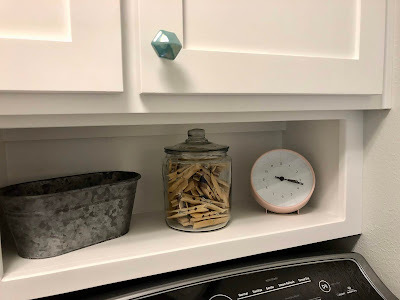 I kept looking at laundry room makeover pictures for inspiration, and I finally went with the extremely standard glass jar of clothespins - not that I'll ever use them - but it was cute, inexpensive, and appropriate for the room...and I like it. I think the wood next to the tin adds some nice texture to the shelf. I bought the two pink pots at Ikea a while back - I'm a sucker for all of the colors in this line. The light pink pot works great to hold our laundry change, and a fake plant in the darker pot added a bit of greenery. The left side was empty because I couldn't figure out what else to put there. Even going with the laundry theme, it seemed silly to put a jar of powdered laundry detergent with a scoop in it on the shelf, which is in every laundry room makeover picture, because we use liquid detergent. 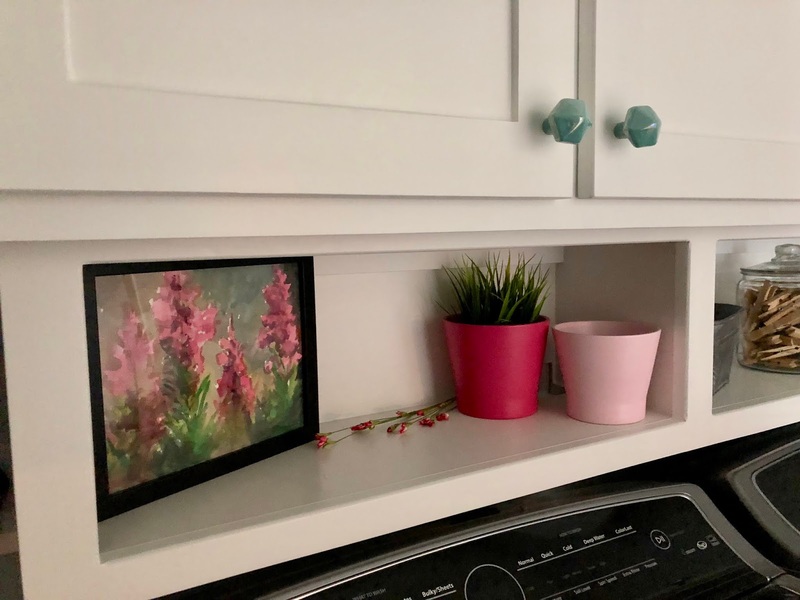 Even though I'd taken out all of our art to hang in other rooms and had it all leaning against the wall in the dining room, I didn't think about using the pink flowered watercolor in the laundry room until last week. It was in a much bigger frame with a huge mat, but I saw it with a different perspective and took the frame apart. All I needed to do was trim a little bit off the edges and it would fit into an 8x10 frame. It's an unexpected spot for art but I see it all the time and that makes me happy. My Grandmother painted it and I know she would have been pleased with this display. My last pretty addition to the laundry room were pink tags to label the baskets. When I was putting the room back together after the renovation, I organized all of the small things like light bulbs and candle holders and bandages into baskets - but we couldn't tell what was in them at a quick glance. I kept thinking I would get some miniature chalkboard tags to use as labels, but every time I went to buy them, I wasn't that enthused, so I held off. Once I had the pink theme firmly established, it was easy to walk down the party/gift wrap aisle at the arts and crafts store and pick up a pack of tags; I'm glad I waited on the chalkboard tags because the pink ombre tags were a cute way to bring a little cheer inside the cabinets. 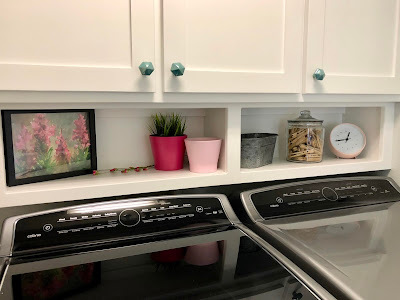 I added up everything that I spent on the laundry room decor and it came to about $35, which felt like the right amount to put into prettying up the room. Best of all, it's my little pink oasis - and if you're wondering, the answer is yes - laundry is a much more pleasant chore now. Well you know I love the pink touches! Also, I feel very inadequate and very glad that my laundry "room" is behind folding doors so I don't have to decorate it lol. Down to the last detail. Seriously, you should give me lessons. Looks great! Thanks! First lesson: Start small. Seriously...pick one area, like a cabinet or a single drawer, and go from there. That looks great! And you gave me a good idea--baskets, for all the assorted things I keep on the laundry room shelves. So cute and organized! I like the little touches of pink. Everything is so pretty! I love pink! That is cool that your grandma painted that picture. I have a shelf in my bathroom that has 2 glass jars on it ( from Princess House). I have bath salts in them for decoration. One is purple and I think the other is white or light pink. I thought I would use them and refill them but I never did! I could really use the shelf space but I guess this makes it more decorative! I try to not have merely decorative items in areas where I need function, but sometimes, the decoration wins out. It's hard when things are so pretty, right? But you did a great job, Shelley, and it makes it look nice and not just functional, like my messy laundry room does. I need to talk hubby into cabinets with shelves! I didn't know it was a thing either until I started looking at ideas for our renovation. And if I didn't have that cute shelf I probably wouldn't have done anything - but give me a shelf and suddenly I need to make it pretty, LOL! You know, I've always wanted to make over my laundry room because that's where I spend ALL OF MY TIME. Seriously when my dogs are looking for me, they check there first. Love what you did with yours and the pink is spot on! OK that's funny - your dogs KNOW you big time! I. Love. It!! This room looks fabulous, especially the pop of pink! Great job! Also, what are your thoughts on the washer and dryer? Mine are super old and the washer almost broke last weekend, so we started doing our research! Thanks! Regarding the washer and dryer: we got them earlier this year - they replaced our old front loader that was always mildewed, even with leaving the door open and replacing the seal a couple times. So I wanted a top loader with no agitator and we liked this model because the control panel is a glass touch screen, like an iPad. The control panel on our old units cracked and I had clear packing tape over them for years, and I wanted to avoid that. The washer is great in that you can wash a huge load of laundry. 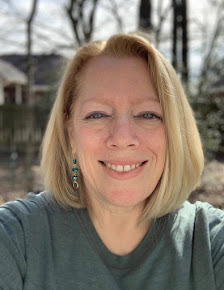 Occasionally there seems to be some white streaking on clothing, which is weird because I use liquid detergent, so I will do an extra rinse cycle when I think that might occur. Also, I'm short and it's a stretch for me to reach the bottom of the washer to take out the clothes, which is why I have a little stool next to the machine. If you're taller you probably wouldn't notice that. The dryer has a steam feature, which makes it very deep - we barely fit it into the room with the vent; the door to the laundry room has about an inch clearance. I don't have regrets about buying these, and we got an amazing deal because they were last year's models, but there are some caveats that you need to be aware of if you're considering this type of washer/dryer. Hope this helps! You're SO good at this! I love the little details, like the clothespins. And love that you have that painting by your grandma! Ugh, the TJ Maxx curse. It'll never happen again! Buy now, return later! That happened to me with some mugs there, sigh. Thanks! And yeah, that TJ Maxx curse is for real. Very nice laundry room decorations!!! Cheerful and simple...the perfect combination! 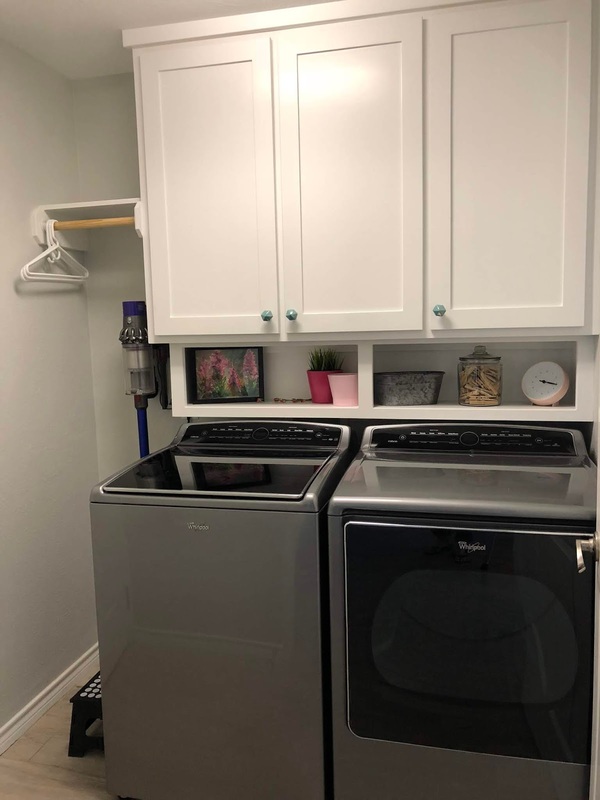 That's a sharp looking laundry room! And small though it may be, it still is a great room. Ours is in the basement LOL.